ST announces STCF04, an integrated camera flash and torch controller that raises the maximum power of an LED flash module from a few Watts, typical of today’s designs, to over 40 Watts, producing the brightness equivalent to an outdoor security floodlight. The STCF04 is used in a configuration combining a supercapacitor, a discrete high-current MOSFET switch and high-power white LEDs. A complete flash module built using the STCF04 occupies around 60mm2 of pc-board space. Although larger than other LED modules of lower power, the result remains significantly smaller and simpler than a xenon circuit while satisfying the demand for very high-energy flash illumination. The STCF04 is currently sampling with full production planned at the end of Q1 2012 The controller is priced at $2.00 for orders of 1000 pieces. Two major partners – Murata which is leading producer of supercapacitors and OSRAM which is a top-tier supplier of flash modules for leading smartphone platforms have begun using the device to showcase the best capabilities of their latest products. A recent Adimec blog post discusses the merits of CCD and CMOS sensors in traffic camera applications. The article concludes: "In 1 to 2 years, CMOS image sensors will outperform CCD regarding traffic requirements in high speed applications. It may then take some time for CMOS to take over in systems as the market accepts the change and makes all of the corresponding system changes". PR Newswire: 10MP OV10810 has been named the best image sensor of 2011 by Electronic Design Magazine, as part the publication's annual 'Best Electronic Design' awards. Determined by staff editors, the awards recognize the most significant designs and innovations of the year across fifteen categories, ranging from power and communications to components and displays. "The OV10810's ability to capture full-frame 10-megapixel images while simultaneously recording 1080p high-definition video sets it apart from other image sensors," said Mathew Dirjish, component editor at Electronic Design Magazine. "The complete convergence of high-resolution still photography and high-definition video places it in the top ranks of this year's best image-sensing technologies." "The OV10810 leverages our second generation OmniBSI pixel architecture", said Devang Patel, senior product marketing manager at OmniVision. I'm a little confused about the difference between the second generation OmniBSI, OmniBSI-2 and OmniBSI+. Interesting that neither initial OV10810 announcement nor the product's page mention the second generation of OmniBSI. Q: The megapixel race seems to be over, as consumers are becoming more savvy about the quality of the images their devices capture - how does this affect you and how do you react to these needs? A: It is a relief that we don't have to hunt for a larger number of pixels for every new generation of phones. But there is still some market pressure for high numbers. We could make a better balanced system with somewhat better perceived image quality if we could pick the megapixel number purely from a technical and image quality point of view. "...there is the market for sports cameras that consumers can attach to bicycles, helmets, surfboards, skis, cars, motorcycles etc. to capture exciting video and images of their personal sporting adventures. Aptina has a strong position in this market, with what we believe is well over 70% market share, and we expect to secure this position through advances in our high-speed HD video enabled sensor offerings. ...Manufactures of sensors for the mobile market are passing the gate of 1.4 micron pixel node and working on 1.1micron pixels and smaller. The automotive market is moving from 5-6 micron pixels to 3-4 micron pixels. Sensors for the high-end digital camera market are targeting smaller pixels in the 2um - 4um range. ...It is interesting while the world economy and the semiconductor industry are expected to grow in the low single digits of percentage in the coming years, we see the narrower semiconductor segment of image sensors as growing in excess of 15% year-over-year going forward." Albert Theuwissen's new blog post talks about seemingly simple thing - how to measure average response to light. The simple thing has many caveats though. DALSA Imaging Blog has a new post on QE basics, with promise to publish more on pixel design. Photron announced 1M fps fast camera, the FASTCAM IS-1M, based on ISIS-CCD (In-Situ Image Storage-CCD), better known as IS-CCD. The IS-CCD uses an image storage buffer immediately beside the light sensitive portion of the 10-bit pixel to greatly increase the speed achievable by conventional high speed cameras. The 100 frame in-situ image buffer is said to provide an adequate synchronous record duration for the majority of ultra high speed phenomena such as ink jet droplet measurement, micro PIV, combustion, crack propagation or blast dynamics. The camera resolution is 312 x 260 pixels and it consumes 150W. Its datasheet has nice pictures of various high speed events. Chipworks reverse engineering report reveals a second 1.12um pixel in the wild - Samsung S5K3L1. "The Samsung S5K3L1YX03 is a 12.1 Mp, 1.1 um pixel pitch back illuminated CMOS Image Sensor and represents only the second company (to date) to ship at this pixel generation". "The S5K3L1 supports 12Mp full resolution images at 30 frames per second (fps) and 1080p full HD video at 60fps, 720p at 90fps, and VGA resolution images at 120fps. The new image sensor also includes an on-chip pixel correction feature. In addition, the 12Mp imager offers an RGB-white color filter array, which delivers advanced sensitivity while reducing noise, resulting in a 30 percent brighter image over that of a conventional RGB color filter array. The RGB-white filter feature works in conjunction with a complimentary [complementary - thanks to EF] logic chip". Thanks to EK for the link! PC Magazine: "A tipster tells PCMag.com that Microsoft is developing the new Kinect system in-house instead of relying on PrimeSense". EETimes: Ilan Spillinger, CVP Hardware and Technology, Interactive Entertainment Business at Microsoft emphasizes his company role in bringing Kinect technology to the market: "With Kinect, it’s was all about the ability to believe. It was taking the raw technologies in their early stages, building demos, and creating something that no one ever shipped before, something that on paper costs a lot, and is clearly not just a consumer-electronic device. How do you pick technology and put soul into it? How can you effectively work closely with content developers, the creators, to formulate a compelling story about why this technology brings new experiences to the market?" BBC reports that Microsoft has launched a version of Kinect to work with Windows-based PCs. The new hardware features a "near mode" which allows it to track movements as close as 40cm away, compared to 50cm on the original model. However, the updated device costs nearly twice as much as the Xbox 360 version. Microsoft links the increase to enhanced features - including "skeletal tracking" and improved speech recognition - as well as the cost of developing a device that works across several systems, rather than a single games console. Kinect for Windows' general manager Craig Eisler told the BBC that the company subsidized the Xbox version and recouped the money from games and other related sales. Albert Theuwissen, professor at the Delft University of Technology (Delft, the Netherlands) and CEO of Harvest Imaging (Bree, Belgium) was elected Electronic Imaging Scientist 2011 at the Electronic Imaging conference, one of the world’s largest events in the field of digital image sensors, electronic cameras and their applications, held in San Francisco from January 23rd-26th. Every year academic and industrial researchers from all over the world who are active in this field choose a colleague who has made valuable contributions to it. This year the honor was conferred upon Theuwissen, who has an impressive career in the field of image sensors. “Theuwissen has demonstrated excellence and commanded the respect of his peers by making significant and substantial contributions to the field of electronic imaging via research, publications, and/or service which led to this award,” Majid Rabbani and Gaurav Sharma, the chairmen of this year's award committee, said. From 1983 to 2002 Theuwissen worked with Philips Research in Eindhoven, The Netherlands, on charge-coupled devices (CCDs), also called bucket brigade memories, first as a researcher, and later as department head of the research group involved in digital image sensors. When this group ended up being part of the Canadian company DALSA in 2002, Theuwissen as chief technology officer was responsible for all research and technical development in that company. In the early days of digital image sensors CCDs generated images of better quality than image sensors made with CMOS-technology, the prevailing semiconductor technology. Today most image sensors that are part of video cameras, photo cameras and cameras in mobile communication equipment, are made in CMOS technology. Theuwissen was involved in research concerning all aspects of image sensors: pixel size, speed, sensor size, sensitivity. In 2007 Theuwissen left DALSA and founded Harvest Imaging, a company involved in consultancy, coaching and training in the field of digital image sensors. Projects range from specification of image sensors for specific applications to forensic research in homicide cases. Furthermore, he is co-founder of ImageSensors Inc, a non-profit public organization serving the R&D-workers in the field of image sensors by investigating their needs and looking after their interests. He has written more than 160 scientific papers and is, amongst other things, an IEEE Fellow. From 2001 onwards, Theuwissen has been professor at the Delft Technical University where he teaches solid-state image sensors and supervises master students and PhD students in their research work. Unfortunately he was unable to attend the award ceremony in person because one of his students had to defend his PhD thesis on the same day. According to the LinkedIn records (record 1, record 2) Omnivision seems to open a branch in Oslo, Norway. The two ex-Aptina designers started to work there in December 2011. Update Feb 3, 2012: As of today, LinkedIn lists 5 employees in Omnivision Oslo branch, all of them are ex-Aptina. Imec has held demonstration a hyperspectral camera solution with an integrated hyperspectral sensor at SPIE Photonics West on Jan. 24, 2012. Imec’s hyperspectral sensor consists of a set of spectral filters that are directly post-processed at wafer level on top of CMOSIS CMV4000 sensor (a 4MP sensor with a maximum framerate of 180fps). The hyperspectral filter, developed at imec, has 100 spectral bands between 560nm and 1000nm. The filter bandwidth (Full Width Half Max) ranges from 3nm at 560nm to 20nm at 1000nm, and the transmission efficiency of the filters is around 85%. The speed of the demonstrated system corresponds to an equivalent speed of 2,000 lines per second, significantly exceeding current state-of-the-art hyperspectral sensors. To match to specific application requirements, the image sensor can be selected (a commercially available sensor or even a custom-designed sensor), determining pixels sizes, maximal frame rate, etc. The hyperspectral filter can be tuned by changing the number of spectral bands and their spectral resolution. The hyperspectral technology can be very useful in many application domains such as crop screening, food selection, skin cancer detection, target detection, etc. Business Wire: BAE Systems-Fairchild Imaging repeated its August 2011 announcement on 1080p sCMOS image sensor, the Fairchild Imaging CIS1021. The new PR mostly repeats the statements from the previous one. BBC on Patent Aspects of Sony "RGBW Coding"
"When Kodak patented the idea it noted that the technology would be suitable in situations involving "short exposure time, small aperture, or other restriction on light reaching the sensor". It specifically mentioned "non-camera devices such as mobile phones and automotive vehicles" as two examples." And then: "Neither Sony nor Kodak responded to requests for more detail about the patents involved". As the first step towards the commercialization of its new CMOS image sensors, Sony has developed a model with built-in signal processing functionality. Samples will be shipped from March, 2012. Accordingly, models have been developed with Sony’s unique "RGBW Coding" function, which facilitates low noise, high quality image capture even in low light condition, and the proprietary "HDR Movie" function improving color when taking pictures against bright light. Update: JCN Network adds few more words on the "RGBW Coding" and "HDR Movie" features and product launch schedules. "...while the individual pixels of the newly developed models are extremely minute at 1.12um, the incorporation of the "RBGW Coding" function has realized a SN ratio (signal-to-noise ratio) equivalent to that of a unit pixel size of 1.4um under conventional methods, which in turn has enables the image sensors to achieve a higher resolution at a more compact size. The new models are also able to output signals through the conventional RGB method, thus there is no need to change the signal processing adopted in existing devices." 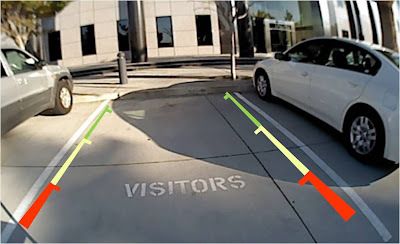 "HDR Movie" uses "two different exposure conditions within a single screen shooting and conducts the appropriate signal processing for the captured image information under each optimal exposure condition. This process generates an image with a broad dynamic range and enables shooting of both the background and subject matter with brilliant colors even in a bright environment." Type 1/4 Stacked CMOS Image Sensor with approx. 8.0 effective megapixels (equipped with "RGBW Coding" and "HDR Movie" functions) - Sample shipments planned for August, 2012"
Street Insider quotes Needham analyst Rajvindra Gill saying "OVTI has lost the image sensor socket on Apple’s next-generation iPad 3 HD to Samsung. We believe the iPad 3 will include a 5MP sensor for the back-camera and will support HD resolution. Our industry checks point to Samsung winning the socket based on price competitiveness rather than better quality/technology. Five megapixel sensors are a relatively mature technology, having existed in the marketplace for over two years, and therefore other competitors, such as Samsung, Aptina and Toshiba, have developed cost competitive sensors. On the iPhone 4S front, we still contend Sony is 100% sourced at Apple. However, OVTI is trying to ramp its BSI-2 yields to 70-80% in order to be qualified as the second source (sometime in C2Q). At this juncture, it’s still uncertain". The full Needham report can be downloaded here. Needham adds regarding the BSI-2 yield: "Our checks indicate that OVTI’s yields on its BSI-2 8MP sensor are running at 40-50%. We believe OVTI is still trying to become the second source to Sony for the 4S in C2Q. However, we believe OVTI has to increase its yields to 70-80% in order to be considered a viable second source". Thanks to CA for sending me the news! The company describes the challenges in deep photodiode manufacturing: "When conventional methods are used for implanting isolation regions, it can be challenging to form very narrow and deep isolation regions. Isolation regions are typically formed by implanting ions through the openings of patterned photoresist. If very narrow openings are formed in photoresist, the walls of the openings may be unstable. Narrower openings could be formed in thinner photoresist, but thinner photoresist would limit the permissible energies used during ion implantation and resulting implants would be too shallow. Shallow isolation regions are undesirable because they would limit photodiode depth, reducing the quantum efficiency and sensitivity of the pixels." Harvard University: SiOnyx Founder Eric Mazur with four his students won SPIE Green Photonics Award for Laser-assisted Manufacturing and Micro/Nano Fabrication. The winning paper was written by Eric Mazur, the Balanski Professor of Physics and Applied Physics, with graduate students Benjamin Franta (lead author), Meng-Ju Sher, and Katherine C. Phillips in the Harvard Department of Physics, and Yu-Ting Lin at Harvard School of Engineering and Applied Sciences. The group used femtosecond laser pulses to modify and control both the chemical composition and the surface structure of silicon. These modifications affect the optical and electronic properties of the material that they called "black silicon" with a potential for use in novel photosensitive devices. The award will be presented on January 25, 2012 at SPIE Photonics West in San Francisco. Teledyne DALSA begins its Imaging Blog. So far it has just the first post starting a talk about machine vision interface standards: "It started smoothly with Camera Link more than ten years ago. Then came DCAM for Firewire, followed by GigE Vision which paved the way for GenICam (itself divided into 3 modules: GenAPI, GenTL and SFNC), EMVA1288, and now CoaXPress, Camera Link HS and USB3 Vision." I hope the blog would be updated regularly! "Over 30 different CMOS Image Sensors are manufactured by Plessey ranging in size from <1MP up to wafer-scale sensors. These products demonstrate very low dark currents, high radiation tolerance and high dynamic range. By working closely with our customers, Plessey ensures leading edge performance across a range of market sectors: Automotive, Medical, Dental X-ray, Professional Digital Photography, Industrial Imaging, Gene Sequencing, Space, Security, HD TV cameras... CMOS Image Sensors manufactured by Plessey feature low dark currents, radiation tolerant processes and a range of pixel sizes from 6.7um to 125um. Sensor sizes range from 1/2” optical format to full wafer scale sensor by using 1D or 2D stitching." Business Wire: Aptina announces ASX340AT automotive SOC sensor for applications such as rear view cameras, blind spot monitoring and surround view without the need for additional processing chips. The 1/4-inch VGA sensor features 5.6um pixel with operating temperature range of -40ºC to +105ºC. The ASX340AT also provides notable features such as dynamic overlay capability, which allows camera system designers to add colored graphics to the display to enhance the experience of the driver, and a crop and zoom feature enabling customization to suit a wide range of vehicle body designs. Additionally, there is an on-chip temperature sensor for dynamic system feedback and additional optical pixels to assist lens alignment during camera manufacturing. The ASX340AT SOC will be sampling starting calendar Q1 2012. It is available in a 7.5mm x 7.5mm, 63-ball iBGA package and is AEC-Q100 qualified. Automotive rear view with graphical overlay. "Multi-aperture optics for wafer-level cameras"
Overview of the different types of miniaturized camera modules. A schematic sideview of the optical system is shown on top of each ﬁeld and a view on the image sensor on the bottom. 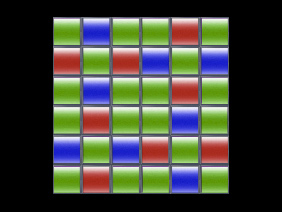 Visualization of a braided sampling of the object space by multiple optical channels. The different colors illustrate the correlation between patches on the object plane, optical channels, and partial images in the image plane. Schematic cross section of the electronic cluster eye prototype illustrating the layer structure of the optical module, which is directly attached to an image sensor. Drawing is not to scale. Size comparison between the fully assembled electronic cluster eye with VGA resolution on the packaged image sensor and a commercial plastic VGA lens. Forbes looks into the just released Apple Suppliers list that constitutes 97% of Apple's spend. OmniVision is not listed, while Sony is there. Forbs writes: "The reasonable conclusion is that OmniVision has either lost all of its business to Sony or its business with Apple now is just a shadow of what it used to be". It was reported earlier that iPhone 4S VGA front camera is Omnivision's. Probably it belongs to the non-listed remaining 3% of Apple’s procurement expenditures. poLight Technology from polight on Vimeo. Business Wire: Image Sensors 2012 conference, formerly known as Image Sensors Europe, has officially announced its agenda. It mostly follows the unofficial version presented earlier, with most notable exceptions being the omission of presentations by Eiichi Funatsu, Senior Manager, Sensor Division, Sony and by Koichi Mizobuchi, Deputy General Manager, Imaging Technology Development, Olympus. The conference is to be held in London, UK on March 20-22, 2012. PR Newswire: OmniVision announces 8MP 1.4um pixel OV8825 sensor, the first one to use OmniBSI+ technology. OmniBSI+ represents the second-generation of the original OmniBSI technology, said to offer a 60% increase in full-well capacity, a 10% increase in QE and a 10% improvement in low-light sensitivity. This makes the OV8825 an attractive option for smartphone and tablet manufacturers to upgrade their camera from the 1st generation 8MP BSI sensor, the OV8820. "Industry reports expect tablets to reach 250 million units globally by 2014, with a large portion of those using 8-megapixel cameras. Similarly, industry reports project that smartphones equipped with 8-megapixel cameras will see tremendous growth, with estimates ranging up to more than 500 million units in 2014," said Vinoo Margasahayam, senior product marketing manager at OmniVision, quoting June 2011 TSR report. "Given the low cost and overall performance improvements enabled by our new OmniBSI+ pixel architecture, we feel that the OV8825 is an excellent solution for manufacturers in these booming markets." The 1/3.2-inch, 8MP OV8825 operates at 24fps in full resolution, and in 1080p video mode at 30 or in 720p mode at 60fps. A high-speed, 4-lane MIPI interface facilitates the required high data transfer rate. The OV8825's integrated scaler offers electronic image stabilization, and enables the sensor to maintain full FOV with improved SNR in 1080p video mode at 30fps. The sensor's 2 x 2 binning functionality with a post-binning re-sampling filter function minimizes spatial artifacts and removes image artifacts around edges. The OV8825 fits into the industry standard module size of 8.5 x 8.5 mm. It is now available for sampling and is expected to enter mass production in the second quarter of 2012. Casio Presents "Image Sensor Communication Technology"
The sensor's new 3um pixel offers low-light sensitivity of 3300 mV/lux-sec, better SNR and a 5dB improvement in DR compared to the previous generation. Additionally, the OV9713's 12-bit RGB RAW output capability provides optimized HDR, while the embedded sequential line- or frame-based HDR features allow an even higher DR to address high-contrast scenes often encountered indoors. The sensor is also 3D ready, offering frame synchronization functionality for 3D (stereo) camera systems. It comes with a standard 2-lane MIPI interface and fits into an 8 mm x 6 mm x 4.5 mm module size. The OV9713 is currently available for sampling, and is expected to go into volume production by Q2 2012. 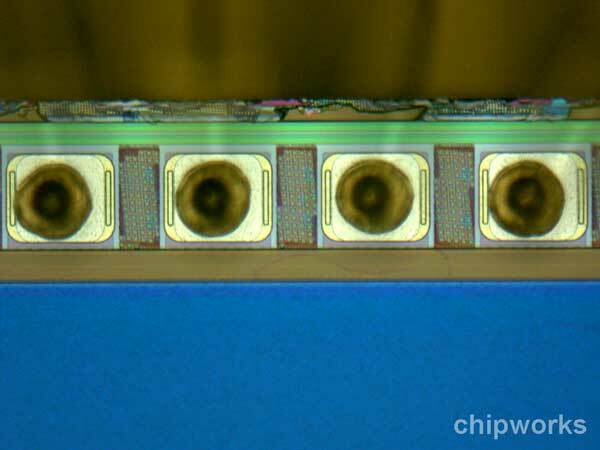 Chipworks reverse engineering of Asus Transformer Prime tablet revealed that its primary image sensor is Omnivision's 8MP OmniBSI-2 sensor "with die markings AEQGG6 OV2B8B0 and according to the specifications the device is the OmniVision 8830". Features that show it to be BSI2 include the suspected TSVs located on either side of the bond pads (shown below) and the copper metallization found during SEM analysis. Thanks to EK for pointing me to this! PMD Technologies announces that is 160x120 pixel 3D FoF imager is ready for mass market usage. The PMD PhotonICs 19k-S3 is said to be the first commercially available 3D-ToF chip for camera developers and system integrators. The read-out clocks of 15MPixel/s are said to be possible. With the integrated SBI (Suppression of Background Illumination) technology the product can be deployed in indoor and outdoor environments. Its 160x120 pixel resolution is optimized for close range human-machine interaction up to 2 meters. PMD reference design CamBoard nano has 37x30x25mm size and is said to be the smallest depth sensor reference design available worldwide. The board is intended for near range applications, has one infrared LED as an active illumination source and is USB powered. Providing a frame rate of up to 90fps at full resolution of 160x120 pixel with a 90deg FOV, the CamBoard nano is suitable for gesture detection. It delivers depth maps and gray value image data simultaneously. The CamBoard nano flyer is here. The power for the board seems to be quite high at about 2.5W, considering its short range up to 2m. currently deployed in the HF M-series." The large 14.3MP 1.5-inch PowerShot G1 X sensor is said to utilize on-chip noise reduction technology and has 4 channel read-out for high speed. Fujifilm announced X-Pro1 interchangeable lens camera featuring 16MP APS-C size X-Trans CMOS sensor. The sensor's color filter array "paves the way for an ideal sensor that does not need an optical low-pass filter. While the optical low-pass filter is indispensable for the reduction of moiré and false color generated by conventional sensors, it also degrades resolution. Fujifilm has developed a new color filter array that is inspired by the random arrangement of fine film grain, removing the need for an optical low-pass filter to solve moiré and false color issues. In the array, RGB pixels are arranged in 6 × 6 pixel sets with high aperiodicity (randomness). Increasing the degree of randomness eliminates the fundamental cause of moiré and false colors — a problem that occurs in conventional arrays when shooting stripes and other repeating patterns. The presence of an R, G and B pixel in every vertical and horizontal pixel series minimizes the generation of false colors and delivers higher color reproduction". 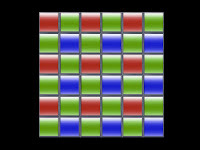 in 2 x 2 pixel units. "Moire is tackled at its root cause by the revolutionary X-Trans CMOS sensor's color filter array. By enhancing aperiodicity (randomness) in the array arrangement, the color filter minimizes generation of both moire and false colors, eliminating the necessity for an optical low-pass filter in the lens and enabling X-Trans CMOS sensor to capture full “unfiltered” lens performance." To process the new color filter data, Fujifilm also developed EXR Processor Pro image processor. Two counters count the clock cycles between the reference levels and the signal and reset levels, then the final value is calculated as the ratio between the two counters. Then one can determine the distance from seeing the parallax between the image sensed by W, Wh and Wv pixels - a nice way to implement a passive 3D camera. PR Newswire: Up to now there were two non-overlapping types of MEMS gyro chips: low sensitivity ones for user interface functions and high-sensitivity gyros used primarily for image stabilization applications. The low sensitivity gyros were intended to recognize coarse movements in range of tens of degrees, but their noise and drift was beyond the requirements of image stabilization systems. The high sensitivity gyros had low noise and drift, but their dynamic range was limited to few degrees, too small for user interface. Now ST claims to overcome this limitation in its L3G4IS dual-core gyroscope employing separate output paths optimized for the two different functions in a 4x4x1 mm package. The device is said to address, at the same time, motion and gesture recognition and optical image stabilization. "ST's dual-core gyroscope lights two candles with one flame," said Benedetto Vigna, Corporate Vice President and General Manager of ST's Analog, MEMS and Sensors Group. "Instead of using two dedicated sensors with significantly different specifications, phone and tablet manufacturers can now simply integrate a single gyroscope for both gesture recognition and camera image stabilization, which enables more reliable performance, sleeker form factors, and lower costs." ST's L3G4IS dual-core gyroscope is sampling now and volume production is scheduled for Q2 2012, with unit pricing at $3.9 for volumes in the range of 1,000 pieces. A number of sources in DSLR community discuss prematurely leaked Fujifilm PR on its new DSLR. The PR says that the camera "features a custom-developed 16-megapixel APS-CMOS sensor incorporating a new filter array and the company's proprietary EXR processor technology". The French magazine Reponses Foto gives few more details on the new color filter and claims that the new sensor uses a random 6-pixel color filter pattern randomized pattern with 6 pixels that eliminates Moire patterns, so no anti-aliasing filter is needed. The new X-PRO 1 camera is supposed to be officially presented at CES next week. I hope more details on color filter would be released. Thanks to SH for sending me the link! Marketwire: Lattice Semiconductor, in collaboration with Aptina, announced that it will be demonstrating a low cost, dual image sensor refence design at the CES. The dual image sensor design utilizes two Aptina MT9M024/MT9M034, 720P image sensors and combines the image into a single bus on which an ISP can operate. The output stream can be used to implement 3D stereoscopic video or for other multi-camera applications. The low cost of the solution enables other consumer applications such as automotive black box drive recorders and surround view cameras. The low cost, low power Lattice MachXO2 PLD and a small SDRAM chip implement the necessary logic and frame buffering that allow the two image sensors to be merged into one ISP bus. "We are pleased to offer this dual image sensor design, which allows ISP vendors to quickly offer multiple camera solutions for the consumer market," said Ted Marena, Director of Business Development for Lattice. "By leveraging the Aptina HiSPi (High speed Serial Pixel interface) bus of the MT9M024/MT9M034, we were able to select a smaller I/O package for the Lattice MachXO2 device, which helped lower the cost." Business Wire: Dongbu HiTek announced that it has been certified to meet all quality management criteria set forth in the ISO13485 standard for the medical devices. Dongbu reports that it has partnered with fabless companies to implement CMOS image sensors for endoscope and x-ray systems as well as for computed tomography (CT) scanners. It may surprise those who have tracked the success of our Micro-electronics business to learn that our largest growth opportunity today is in our Digital Optics business (formerly known as Imaging & Optics). The most bulky component in today’s mobile phones is the camera module. Some of today’s Android phones even feature a “bump” made necessary by the nearly obsolete technology now found in all mobile phone camera modules, built around magnetic coil technology that is over 100 years old and has reached its effective limits of miniaturization. We will introduce camera modules based on silicon rather than magnetic coils to move the lenses for focusing and zoom. This breakthrough MEMS technology is disruptive because it obsoletes the magnetic coils in use today by enabling cameras that are thinner, much faster, have more accurate lens positioning, and use far less battery power. When combined with the other software and technologies that we have already have developed and marketed, it means better quality images and video from miniature mobile phone cameras. Our technologies will enable mobile phone cameras to perform as well as standalone digital still cameras and to compete with video cameras on quality. We are discussing our offerings with Tier One OEM manufacturers of wireless handsets, and expect to ship our game-changing products in late 2012. In short, we have positioned our Digital Optics business with the right technologies and people to exploit a large and growing market that has yet to see the kind of transformative innovation that’s been common in other consumer electronics businesses. First half of 2012: We will sign our first design win for the use of our transformational MEMS optical imaging technology in a new cell phone. Second half of 2012: We will announce major steps toward high-volume manufacturing of devices using this MEMS technology." CEVA announced the availability of its first imaging and vision platform based on its CEVA-MM3000 architecture framework. CEVA-MM3101 is a programmable, low power platform targeting image and video processing in camera-enabled devices, including smartphones, tablets and smart TVs. The CEVA-MM3101 platform integrates image and video pipeline, image enhancement, embedded vision applications and image encoding functions. Instead of using fixed-function engines or running these functions on the main application processor, the CEVA-MM3101 is specifically architected to support all of these functions on a single processor, resulting in a 20X reduction in power consumption when compared to CPU-based solutions. The CEVA-MM3101 is capable of processing video streams of 1080p, or 8MP images at 12 fps, with video stabilization, color correction, wide dynamic range (WDR), face detection and gesture recognition. CEVA has collaborated with eyeSight to deliver a comprehensive offering for Human Machine Interface (HMI), based on the CEVA-MM3101 platform. eyeSight's offering includes hand gesture recognition and virtual mouse user interface technology using finger tracking for multiple users in various conditions. CEVA and eyeSight will demonstrate a range of real-world applications for this technology at CES 2012. At the heart of the CEVA-MM3101 is a programmable Vector Processing (VP) engine. The Vector Processor performs filtering and the vector-type operations required for pixel processing. It is based on a dedicated pixel-processing VLIW/SIMD architecture with 10-stage pipeline. It contains 7 different units that can work in parallel enabling flexible combination for different type of instructions. All instructions are conditional execution using predication optimized to save code size. The VP can handle 32 byte operations in one cycle and contains special instructions that can be configured in order to create proprietary filters for video and imaging processing. This strong processor is optimized for multimedia operations, capable of 64 SAD calculations in one cycle as well as producing 8 results for 6 Tap filters – which make it ideal for image signal processing algorithms. Electronics Weekly, Physorg: Fraunhofer January 2012 News Magazine announced a lateral drift photodetector (LDPD) which boosts the speed of traditional CMOS sensors so removing the drawbacks of Pinned Photodiodes (PPD) using pixel size 10 µm or above. "...when the pixels exceed a certain size, the PPDs have a speed problem", explains Werner Brockherde, head of department at the Fraunhofer Institute for Microelectronic Circuits and Systems IMS. Low-light applications tend to call for high image rates. "But the readout speed using PPD is too low", says Brockherde. The Fraunhofer researchers have developed a new photodiode, the lateral drift ﬁeld photodetector (LDPD), that is said to be unique and has already been patented. "In this component, the charge carriers generated by the incident light move at high speed to the readout node," explains the researcher. With the PPD the electrons are said to diffuse to the exit; a comparatively slow process but which is sufﬁcient for many applications. "But by integrating an internal electric ﬁ eld into the photoactive region of the component, we have managed to accelerate this process by a factor of up to a hundred." To produce the new LDPD, the Fraunhofer researchers improved upon the currently available CMOS chip manufacturing process based on the 0.35 μm standard: "The additional LDPD component must not be allowed to impair the properties of the other components," says Brockherde. The prototype of the new high-speed CMOS image sensors is already available. "We expect to get approval for series production next year," says Brockherde. Albert Theuwissen published that Max Collet, the head of Image Sensor R&D group of Philips Research in the 80’s passed away at the age of 70. Contrary to the previously published rumors, Beijing, China-based Superpix announced a bunch of new sensors targeting consumer market. The company information page says it has "developed a board range of high performance image sensor and relative image process chip, and most of them achieved domestic advanced level. Up to now, there are over 50 million chips had been sold. And based on customers’ comments, the products are stable and reliable. The latest 12MP CMOS image sensor is the very first domestic product beyond 10MP, which represents the highest level of that field in China. The company has been appraised “100 Innovative Experiment Enterprises” by ministry of science and technology, and won the honor of “A Level Credit Outstanding Corporation”". The 2MP 1/5-inch SP2518 is said to be "based on the 3rd generation 1.75um CMOS image sensor pixel architecture designed by SuperPix". With Integrated ISP it consumes 220mW power. The reported dark current is 40e/s at 60C. The maximum SNR is 38dB, quite in line with other sensors with similar pixel size. The summary table above says SP2518 is able to work at 15fps speed, the product page claims 13fps at full 1600 x 1200 resolution, while the product flyer says the speed is "up to 12fps" at full resolution.